Home > racing > FIA GT Racecar. GTR LM ? This car was spotted at Fuji racetrack doing some shake down runs. 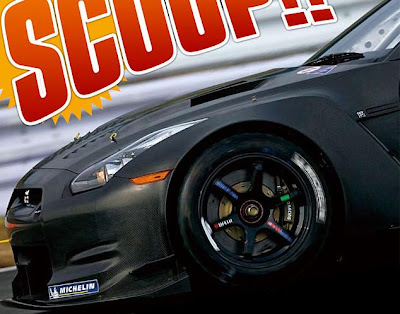 It looks to be either the GT-R LM that has been rumored, or perhaps a variation on a race car. Japanese 'Auto Sport' magazine revealed the first details on a GT1 class Nissan GT-R R35 built on the new 2010 FIA GT1-Class specifications. Nissan performed the shakedown this Monday, December 22nd, at the Fuji Speedway. According to Auto Sport it sounded like it was equiped with an V8 engine and was running on Michelin rubber with AP-Racing brakes. The best lap time the car set up during the shakedown was an 1'38"3. It appears to have plexiglass windows , side exhaust exhaust , center lug wheels. Big front splitter. New rear wing. Perhaps its rear wheel drive only ? For LM, and ALMS classes the car would have to be rear wheel drive. When we get some more information and pictures, we will put them up. Be looking for them. AP Racing brakes, and the carbon fiber work can be seen. In this picture you can see how much wider the front and rear fenders are than the stock car. I would prefer to see the car as a V6 turbo, but it is likely that Nissan will follow the Super GT cars V-8 program. i updated the link with more information and annother image. enjoy!